Sound familiar? This past weekend, I learned something new as I watched my sister make potato salad. She followed the same basic steps except she wasn’t watching her pot to make sure the water didn’t boil over. So, I did. It suddenly dawned on me that she had a wooden spoon lying across the pot. I guess that’s a good place to put the spoon so you don’t have to use a spoon rest. My sister thought it curious that I was sitting watching the pot and informed me that I didn’t have to watch it as the water wasn’t going to boil over. What? I asked. 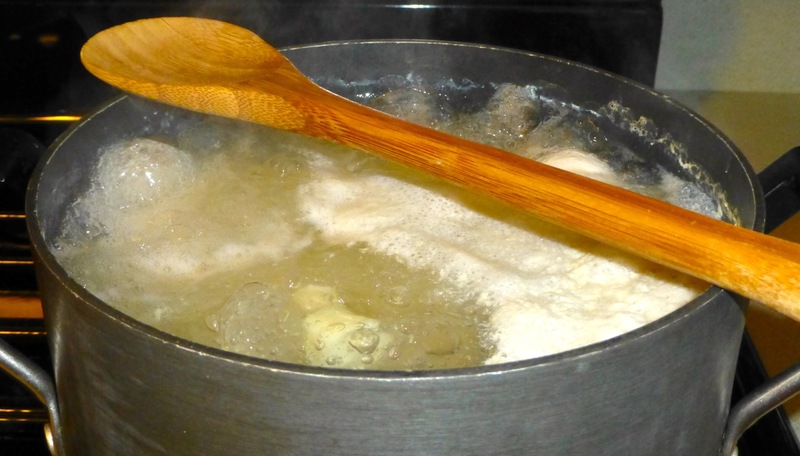 “The water is not going to boil over because the wooden spoon won’t allow it to,” she said. Yeah, right, I thought. So I continued watching. And continued watching. And continued watching. And the water did not boil over. Pretty interesting, eh? Or am I the only one who didn’t know about this cooking tip? Are there any other tips any of you know of that seem “unbelievable” but work perfectly?